1920 marked a lot more than just the first year of a new decade from a historical perspective. In a lot of ways, it was a year that would change the world in a number of unique ways that are certainly worth exploring. In January, the Treaty of Versailles officially went into effect – thus ending World War I and setting the stage for World War II a short time later. The 18th Amendment to the Constitution also went into effect just a few days later, thus beginning an Era of Prohibition in the United States. The U.S. Senate would vote against joining the League of Nations, the American Civil Liberties Union (ACLU) was founded, and Babe Ruth would be traded to the Boston Red Sox for $125,000 – the single biggest sum of money ever paid for a baseball player up until that moment. All this, and we haven’t even gotten out of January yet. Based on all of that, it should come as no surprise that 1920 was every bit as impactful as far as the Southern Pine Association was concerned. In this section, you will learn more about the indelible mark this organization left on its industry. You’ll learn more about the cooperation with the United States Emergency Fleet Corporation in the disposition of its surplus lumber stocks. You’ll gain insight into special classes of lumber that consumers were using to ascertain, establish and sort the product of sawmills into special grades. We hope that it is every bit as eye-opening as you want it to be and that it will continue to further the narrative of the Southern Pine Association during this critical moment in time. The Southern Pine Association was recognized as standing for the highest ideals of business ethics. Its impartiality in arbitrating disputes as to grades was not questioned. It was regarded as an organization established and maintained for the purpose of advancing the welfare of the lumber industry of the South and the prosperity of all the people; a capable and intelligent exponent of a manufacturing industry that worked for constructive development through collective thought and progressive ideas. By reason of the size and character of the southern pine industry and its close relation with the public, the Association accepted the early recognition of being the authorized representative. Conceived and dedicated to the purpose of rendering service to everybody engaged in the production, distribution, and consumption of southern pine, it accomplished much in the light of public service during the six years of its existence. Closely identified with the commerce and prosperity of the South it benefitted business and financial welfare. Cooperation with the United States Emergency Fleet Corporation in the disposition of its surplus lumber stocks; the Federal Trade Commission in their fact-finding missions; the post-war Soldier Settlement movement; the Bureau of Foreign and Domestic Commerce in their studies of lumber manufacture and potential foreign markets; the U.S. Treasury Department concerning Federal Tax laws; the Interstate Commerce Commission car allotment work; various departments of the State and Federal Government in communicating with producers of southern pine; and the Government of France at their Reconstruction Exposition in Paris, the Southern Pine Association activities were many, versatile and of practical value. Special classes of lumber consumers were individually serviced to ascertain, establish and sort the product of sawmills into special grades most nearly meeting their particular needs. Retail dealers were consulted when any important change in yard and stock grade specifications was considered. Through the National Lumber Manufacturers Association, other lumber manufacturers associations were contacted in order to cooperatively consummate the all-species standardization of lumber sizes and patterns. Standard specifications for southern pine lumber had already been published by the Southern Pine Association and accepted by manufacturers and retailers. For determining lumber grades in dispute, the Inspection Department, which applied grading rules and standard specifications, performed valuable and indispensable service. Of 1,448 claim inspections, 628 were made at the request of non-members of the Association, who paid the per diem fee and all expenses for the inspection service. A staff of 36 experienced lumber inspectors was maintained by the Southern Pine Association. They contributed important aid to the public in establishing the permanence of proper and adequate grading rules, and the orderly conduct of the southern pine lumber industry. A total of 1,530 mill inspections, in 11 districts, was made during 1920. With the approval of the American Institute of Architects, the Southern Pine Association and the Architects Small Home Service Bureau of Minnesota published workable building plans for small homes and frame dwellings. The American Society for Testing Materials. The American Institute of Architects. The American Food Preservers Association. The National Board of Fire Underwriters. The Master Car Builders Association. Difficulties arising from differences in particular items of the grading and dressing rules between the North Carolina Pine Association, the Spruce Association, the West Coast Lumbermen’s Association, and the Southern Pine Association, resulted in controversies in the matter of standard sizes of lumber. Practice in Detroit and throughout the East affected working 2 inch material to 1-3/8 inches in place of 1-3/4 inches, and 1 inch material to 3/4 inches in place of 13/16 inches. Local building codes did not then concern themselves with these refinements, although practicing engineers regarded it as essential that a definite classification be universally employed. Discrepancies in grading rule application among retailer dealers in the East reacted unfavorably for manufacturer, dealer, architect, engineer and consumer. Efforts to have municipal building codes adopt proper timber specifications were made. Research work on the physical characteristics of southern pine – the holding power of nails, transverse bending, cleavage, and splitting – was in progress. The grading rules were reissued on March 16, 1920. The minor changes chiefly comprised more explicit phraseology to better express the meaning of the rules. Conferences, sponsored by the National Lumber Manufacturers Association with representatives from other lumber manufacturers associations, on the subject of standardization of sizes, were held. 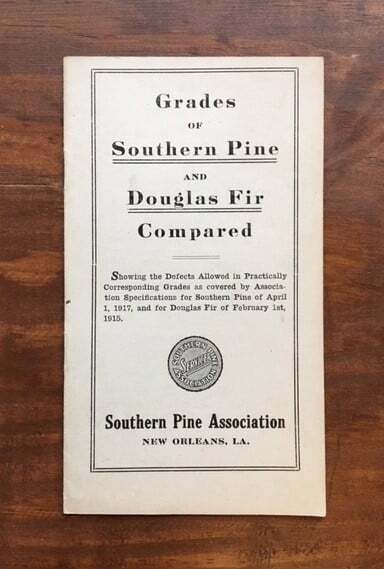 Outstanding in result was that the conferees at the Chicago Standardization Congress (also termed the American Lumber Congress at Chicago) found the Southern Pine Association sizes and templates so desirable and proper that they were willing to recommend them as the standards for all other associations. 1-1/4 inch Finish to 1-1/16 inches instead of 1-1/8 inches. 1-1/2 inch Finish to 1-5/16 inches instead of 1-3/8 inches. 2 inch Finish to 1-5/8 inches instead of 1-3/4 inches. 3 inch T.&G. Flooring to 2-3/8 inches instead of 2-1/4 and 2-1/2 inches. 6 inch Shiplap Drop Siding to 5-1/8 inches face with 3/8 inch lap. The National Retail Lumber Dealers Association officially recommended to the Second American Lumber Congress at Chicago, April 20, 21 and 22, 1920, that, in the light of public interest and the orderly methods of distribution, the branding of lumber be done through the medium of Association branding rather than individual branding. They disapproved of individual branding because consumers were misled and confused as to grade values. Interest in uniform grade-marking was revived. With all mills using the same marking system, the dealers could become acquainted with the same, and identify the lumber for comparison with the order specifications. It was thought that this practice would restrict, if not eliminate, transit car complications and the regrading of lumber by unscrupulous wholesalers. The Supreme Court for the State of Missouri declared (1913) that there were two things no industry could do, viz. : agree among themselves to restrict production and agree among themselves to increase prices. Through an interpretation of a Missouri opinion expressed in favor of the Government, an agent of the Federal Trade Commission by sales argument and infamous petition seeking to find something to justify the expenditure that the Government was making for his sustenance and position, lodged a complaint (1920) through the Department of Justice, stating violation of the Sherman Anti-Trust Law by the Southern Pine Association and everybody who so much as recognized the Association or its activities. The suit constituted the United States Government vs. the Southern Pine Association, et al. Allegations in the bill were declared vicious, untrue and unfair. Loyal and convinced that what had been done was right from any and all angles the subscribers re-elected, without exception, the directors and officers of the Southern Pine Association and remained firm.